Sector Hidalgo— in northwest of the Centro Histórico, Hidalgo is a largely residential sector encompassing the financial district and the Country Club Guadalajara. Sector Libertad— northeast of the Centro Histórico, Sector Libertad is mostly given over to industrial use. However, the southwest part of the sector, close to the Centro Histórico, boasts a traditional market (Mercado Libertad) and the Plaza de los Mariachis. Sector Juárez— southwest of the Centro Histórico, Sector Juárez is a shoppers' paradise: it boasts two shopping malls (Centro Magno and Galerias), as well as the popular Minerva, Chapultepec, and Zona Rosa shopping areas. Sector Reforma— southeast of the Centro Histórico, Reforma is also a mostly industrial sector, but visitors will no doubt be interested in the pleasant, tree-filled Parque Agua Azul, as well as the Tianguis Cultural de Guadalajara, a street market where alternative clothing and articles such as spiked belts, black trenchcoats, military uniforms, used books and trading cards are for sale at good prices. Tonalá— immediately east of Tlaquepaque, Tonalá contains Guadalajara's main bus station, handicraft shops and markets, and the large Parque Solidaridad. Zapopan, a large, busy suburb southwest of Guadalajara, is famous for the old-fashioned charm of its downtown, its active nightlife fueled by the three large private universities within the city limits (Universidad Autónoma de Guadalajara, Tecnológico de Monterrey and Universidad del Valle de Atemajac), its proliferation of modern shopping malls that will make American suburbanites feel right at home, and—by contrast—also large expanses of pristine nature, such as the Bosque de Colomos and the gargantuan Bosque La Primavera. The 275-diagonal bus route runs from Tlaquepaque through the Centro to Zapopan, providing convenient access to all of these outer districts. The co-founders of Guadalajara were Doña Beatriz de Hernández and Governor Cristobal de Oñate. In the Plaza de los Fundadores there is a monument in honor of both of them. Guadalajara, and Jalisco in general, were the epicenter of the Cristero Wars (1926-1929)—a rebellion by Catholic guerrillas against the secularizing reforms of President Plutarco Calles. One of the first armed conflicts of the rebellion took place in Guadalajara in the Santuario de Nuestra Señora de Guadalupe on August 3, 1926, where a group of several hundred Cristeros engaged in a shootout with federal troops. Guadalajara was attacked (unsuccessfully) by the Cristero armies in March of 1929. In the 1950s, Avenida Juárez was widened to create today's arterial road of Juárez-Vallarta which you see today. A famous part of that work was the moving of the central telephone exchange without the disruption of service. Pictures of this feat of engineering can be seen in the City Museum (Museo de la Ciudad). In April 1992, Sector Reforma was rocked by a huge explosion of gasoline, when a gasoline pipeline leaked into the sewers over a period of days until the fumes finally detonated. Some 200 Tapatíos were killed and several thousand injured. The explosion affected mostly the working-class and industrial areas on the south side of the city. In May 1993, Cardinal Juan Jesús Posadas Ocampo of Guadalajara was killed at the Guadalajara airport. Though at the time the murder was thought to have been some sort of politically motivated assassination, subsequent investigations favor the theory that the cardinal was caught by mistake in drug-related violence, his motorcade having been mistaken for that of a drug lord. Cardinal Ocampo is buried beneath the high altar of the Catedral de Guadalajara, probably because it was first suspected that the motives for his murder were political, rather than accidental. 20.521837-103.3111451 Aeropuerto Internacional de Guadalajara Miguel Hidalgo y Costilla (GDL IATA) (South of city along the Guadalajara-Chapala Highway). Airlines serving GDL include AeroMexico, Alaska Airlines, American Airlines, Copa Airlines, Delta, Interjet, United, VivaAerobus, and Volaris. A taxi from the airport to anywhere will cost M$220 (pesos), but many hotels offer airport pickups that can be cheaper. There is also a bus that stops at the bottom of Terminal 1 which goes to the Old Bus Station (Central Camionera Vieja) close to the Centro Histórico and costs M$7. To get to the bus station, take a right upon exiting the airport and follow the signs to the "Terminal Terrestre." Walk past the police station and FedEx building. Pay when getting on the bus. A taxi down to the Laguna de Chapala area, around Ajijic or Chapala, will cost about M$380. At the airport, always buy the taxi chit from the booth before exiting the terminal, then present it to the licensed driver. The new main bus station, 20.621432-103.2858412 Estacionamiento Central de Autobuses Guadalajara, is in the suburb of Tonalá, which serves all long-distance routes (generally those which leave the state of Jalisco). The old bus station just south of downtown is served by bus lines to nearby pueblos such as Tequila and Chapala. Bus rides can sometimes be a bit bumpy because of the state of the roads, but the buses themselves are very comfortable. A taxi from the new bus station to the Centro Histórico should cost around M$60; other options include the municipal bus (M$6) and the TUR bus (M$10, ask for "Centro"). Federal Highway 15 (Carretera Federal 15) connects Guadalajara with Mexico City to the east. The Centro (downtown) is best accessible by walking. Most attractions lie within an area of about 1 km long by 350 m wide. For longer trips, or to get in and out of the Centro, use the bus, subway or a taxi. There are also horse-drawn carriages (calandrias), which are more expensive and touristy. Dozens of bus routes provide transportation around the city. 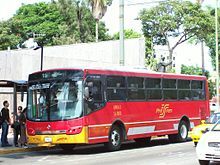 As of February 2011, regular buses cost M$6; there are also luxury buses (Turquesa, Tour and Cardenal) for M$11. Look on the front window of the bus to determine its destination, and ask the driver if you're uncertain. You can also try to purchase a route map (the Guia Roja Red Vial Ciudad de Guadalajara is one option, or ask at any magazine stand or one of the tourism kiosks downtown for a book with bus routes), although as of early 2008 they are no longer being published and are therefore almost impossible to find. This means planning your route ahead—or asking the locals, provided you know some Spanish. Riding the bus also provides a good chance to see different parts of the city and get your bearings. Bus drivers will give you change within limits, though after even a day in Guadalajara you might find more 10-peso pieces in your pocket than you can dispose of. Metropolitan Area Mass Transit System (Sistema de Transporte Colectivo de la Zona Metropolitana). Alternatively, try Busca Tu Ruta (Search for Your Route). Taxis are another option if you don't want to try to figure out the buses. You can either agree on a price with the cab driver or ask him to turn the meter on. Using the latter option, there is a risk that the driver won't the take the shortest possible route if he thinks you don't know it yourself. The meter will normally be a better price than the price the hotel will tell you to pay if they call you a cab. As always, be sure to ask the fare before you get in. Cabs cost more at night or when they have to cross the outer ring (Anillo Periférico) of the city. Daytime fares within the city are rarely more than M$50, and should never exceed 100. At night, the prices are doubled. As a rule of thumb, during the daytime the fare is M$3-4/km and at night M$8-9, but if the driver is using a meter, there's also a starting price of M$5-10. Fares to and from the airport are set at M$260. If arriving at the Guadalajara airport, a taxi monopoly provides the service from the airport. Pay for your taxi ride at the booths outside of the arrival halls. You can take a normal taxi to the airport, though. There is a small light-rail subway system (the Tren Ligero) that can be useful for travelers who happen to be headed where the trains go. There are two lines that meet at the western edge of the Centro Histórico. One runs north-to-south beneath Avenida Federalismo to the edges of the city in both directions. The other runs west-to-east through the Centro Histórico to the eastern suburbs. Fares cost M$6. The subway closes at 23:00. You may also rent a car from airport, most major car rental companies such Avis, National Car Rental, Hertz and Europcar have booths at the baggage claim area. There are also some local car rentals such Veico Car Rental just outside the airport, they also have good cars and often lower prices. This statue of Miguel de Hidalgo is in the Plaza de la Liberación. 20.687533-103.34491 Belén Cemetery (Panteón de Belén), Belén 684, El Retiro, ☎ +52 33 3613 7786. Tours Tu-Sa 10:00, 11:00, 13:00 and 14:00, Th-Sa also at 20:30, 22:00 and 23:30. This old cemetery dates back to 1786. It has been converted into a museum that is full of interesting stories of cemetery hauntings and Tapatío culture in general. There are also night tours Th-Sa that many people are afraid to take! Admission M$22, students $11. Photo and video fee $60. Tours $60. Rotunda of Illustrious Jaliscans (Rotonda de los Jaliscienses Ilustres) (North of the cathedral, between Av. Hidalgo and Calle Independencia, Zona Centro). This lovely circular monument of fluted columns is a mausoleum containing the ashes of 98 important men and women born in Jalisco. The bright and busy atmosphere of the park around it contrasts with the serious aspect of the Rotunda. On the southern side (across the street from the cathedral) is the bus stop for the TuriBus. Government Palace (Palacio de Gobierno), Corona 31, Zona Centro, ☎ +52 33 3668 1800. Daily 09:00-20:00. This is the historical center of the government of the State of Jalisco. Today it is mostly visited for its murals, the work of the famous Jalisciense artist, José Clemente Orozco. The most famous of these is a huge portrait of Miguel Hidalgo in the vault of the old chambers of the State Council. 20.666-103.4036 Chapalita Roundabout (Glorieta Chapalita), Av. Guadalupe at Av. de las Rosas, Chapalita, Zapopan. A verdant gathering place in a lovely neighborhood (colonia) in the suburb of Zapopan, this "garden of art" sees local artists showing off their creations every Sunday while local residents show off their dogs. Raucous celebrations take place here on national holidays. 20.707778-103.3928897 Colomos Forest (Bosque Los Colomos), El Chaco 3200, Colomos Providencia, Zapopan, ☎ +52 33 3641 3804. M-F 09:00-15:00. This lovely, family-friendly green space is a 92-hectare urban forest that boasts 30,000 trees of diverse species. Its mission is to conserve a beautiful example of a native woodland in an urban environment and educate visitors on ways for humans to better coexist with nature. In terms of visitor amenities, Colomos boasts lovely gardens including a Japanese garden and a cactus garden, goldfish ponds where children enjoy feeding the fish, and horseback riding. Smoking is strictly prohibited. M$6, free for children under 12 and on Su, parking M$6. 20.821667-103.3591678 The Expiatory Church of the Blessed Sacrament (El Expiatorio, Templo del Santísimo Sacramento), López Cotilla 935, Zona Centro, ☎ +52 33 3825 3410. This finely detailed Gothic Revival cathedral was built over decades starting in the late 19th century. There is a mechanical clock in the bell tower that features a procession of the Twelve Apostles at 09:00, 12:00 and 18:00. The interior of the church features a lovely collection of stained glass windows. 20.674167-103.3872229 Minerva Roundabout (Glorieta Minerva), Av. Ignacio Vallarta at Av. Adolfo López Mateos, Zona Centro. This glorieta (traffic circle) showcases a giant statue of the Roman goddess Minerva (one of the most important symbols of Guadalajara), surrounded by a fountain. It's sometimes shut down to traffic and opened to pedestrians when there's a major city celebration—such as when the Chivas football team wins a major game. Monument of the Child Heroes (Monumento a los Niños Héroes), Av. Niños Héroes at Av. Chapultepec Sur, Moderna, ☎ +52 33 3825 1340. A massive stone spire that memorializes six teenage military cadets who died defending Mexico City's military academy from U.S. forces during the Mexican-American War. 20.6596-103.348210 Blue Water Park (Parque Agua Azul), Calz. Independencia Sur 973, Reforma, ☎ +52 33 3619 0328, e-mail: parque-agua-azul-92@hotmail.com. Tu-Su 10:00-18:00. Open air concerts, a butterfly enclosure, an aviary and plenty of greenery are some of the things that can be enjoyed at Agua Azul. This is a good place to take a break from the often dry, dusty and crowded environment of the city. The park houses a museum of paleontology, and there is a museum of regional archaeology just across Calzada Independencia. The 1.5 km from the Centro Histórico to the park is quite walkable, but it is also accessible via the 62A and 62D buses along Calzada Independencia. M$4, students, teachers and seniors M$2. 20.728381-103.30833311 Guadalajara Zoo (Zoológico Guadalajara), Paseo del Zoológico 600, Huentitán el Alto, ☎ +52 33 3674 4488. W-Su 10:00-18:00 when school is in session, daily 10:00-18:00 during summer break and on holiday weekends. The modern Guadalajara Zoo is next to the Barranca de Huentitán-Oblatos. It's worth visiting for its view of the canyon, and for its collection of animals, its safari ride and its panoramic train. Other highlights include a reptile house, a nocturnal environment exhibit and a tropical forest simulated environment. M$63, children 3-11 $32, SkyZoo $36, special packages available for access to panoramic train, safari and/or aquarium. Independencia Overlook Park (Parque Mirador Independencia). This lovely park is at the northern terminus of Calzada Independencia adjacent to the Barranca de Huentitán-Oblatos, with beautiful views of the canyon. Pretty gardens and benches are peppered around the park, allowing visitors to sit and enjoy the different views the park has to offer. This is also the starting point for many of the hiking trails that traverse the canyon. Of course, one would be remiss in talking about Guadalajara sports without mentioning the three professional football (futbol, i.e. what Americans call soccer) teams based there: Estudiantes, Atlas, and of course, Chivas. Chivas, more properly known as Club Deportivo Guadalajara, is, according to FIFA, the most popular football team in Mexico. Chivas has won 11 first-division titles and holds the longest-ever season-opening winning streak: 8 back-to-back wins. Chivas is also the only football team in Mexico with exclusively Mexican players, whereas other teams have players of varying nationalities. The team colors are red, white, and blue, signifying "Fraternity, Union, and Sports". The new stadium, Estadio Akron, with a capacity of 49,850, was inaugurated in 2010. Estadio Akron (formerly Estadio Omnilife), Circuito JVC 2800, Ayamonte, Zapopan, ☎ +52 33 3777 5700. This is the stadium where most of the outdoor events for the 2011 Pan-American Games were held, and—more importantly—where the most popular football team in the city and the whole country, Club Deportivo Guadalajara (Chivas), has played since 2010. Chivas plays here every other Saturday at 19:00, unless otherwise specified. If you happen to be in Guadalajara on a Saturday, you are most likely to find either a Chivas football game in this stadium, or an Atlas game at Estadio Jalisco (below). Big games to watch out are Chivas vs. Atlas (which can be held in either stadiums depending on which one is scheduled as the home team) and Chivas vs. América—the "National Superclassic" (superclásico nacional)—as these teams are bitter rivals. Either of these match-ups are sure to sell out the stadium and treat those lucky enough to get tickets to an intense atmosphere. Estadio Akron is a difficult place to reach by public transport. It is close to the Periférico Oriente, so taking a taxi is the best option. Alternatively, use any bus that will go around Periférico and you'll eventually get there, just ask the driver to let you know when you are there, since the stadium's visibility from Periférico is very limited. Jalisco Stadium (Estadio Jalisco), Siete Colinas 1772, Independencia, ☎ +52 33 3637 0563. It's in Colonia Independencia, and can be reached by taking any bus along the Calzada Independencia and asking for the Estadio Jalisco. You will almost definitely see it if you look out, it will be on your left as you come from the center. Here the football team Atlas plays. Chivas used to play on this stadium until 2010, when Estadio Omnilife was completed. During the season there are league games every other Saturday. If Atlas is playing as a visitor, then you can look for a Chivas game at Estadio Omnilife. A big game to watch out for is Atlas vs. Chivas, which has an incredible atmosphere, though most games are worth experiencing. If you are of a nervous disposition, perhaps avoid the upper stands when there is a large crowd as it's known to shake when the crowds begin to jump. March 3rd Stadium (Estadio 3 de Marzo), Patria 1201, Villa Universitaria, Zapopan, ☎ +52 33 3610 1834. The Universidad Autónoma de Guadalajara's football stadium in the north of the city, where "Los Estudiantes" play, is named for the date of the founding of the university in 1935. The Estudiantes play in the Primera Liga along with the other Guadalajara teams, Atlas and Chivas. The Pacific Mexican League is hosted by Charros de Jalisco on its home grounds, the Estadio de Béisbol Charros de Jalisco y Atletismo. Nuevo Progreso Bullring (Plaza de Toros Nuevo Progreso), Montes Pirineos 1930, Monumental, ☎ +52 33 3651 8378. It's right across the road from the Estadio Jalisco, just off Calzada Independencia. Bullfights take place at the Plaza Nuevo Progreso every Sunday at 16:30. Those arriving by bus might not be able to see the bullring from the street, as it's hidden behind some trees, so get off when you see the Estadio Jalisco and go in the opposite direction. Guadalajara Film Festival (Festival Internacional del Cine de Guadalajara), Nebulosa 2916, Jardines del Bosque, ☎ +52 33 3121 7461. The biggest film festival in Latin America and one of the most important showcases for Mexican and Latin American cinema on the world stage, the Festival Internacional del Cine de Guadalajara takes place annually in early March. A bevy of awards are given in all categories of film, and it also serves as a forum for education and creative interchange among Latin American cineasts. Independence Day (Día de la Independencia). Visitors who find themselves in Guadalajara on 16 September are in for a festive and patriotic treat. One traditional way that Tapatíos enjoy celebrating this holiday is with a reenactment of the "Cry of Pain" (Grito de Dolores), the incident that, in 1810, kicked off the war that ended with Mexico's independence from Spain. At the stroke of midnight, locals go to the main square and shout out in unison: half yell "Viva" and the other half "México", going on to the names of important heroes of Mexican history: "Viva Hidalgo", "Viva Morelos", and so on. Pilgrimage of Our Lady of Zapopan (Romería de la Virgen de Zapopan). Celebrated in Guadalajara on 12 October, this event honors the local Virgin Mary figure of the Guadalajara area, the Virgen de Zapopan. On this day, over a million people parade the famous statuette from the downtown cathedral to its home in the Basílica de Nuestra Señora de Zapopan. This festival is only celebrated in the Guadalajara area, and is one of the largest examples of a romería outside Spain. The shopping scene in Guadalajara is centered around two opposing faces of Latin American culture: traditional open-air markets (tianguis) and the modern shopping plazas and malls that, more and more, are sprouting up around the outskirts of town. The latter can be found in particular proliferation southwest of the Centro Histórico in Sector Juárez, as well as in suburban municipios such as Zapopan. A refreshing exception to this rule is the historic downtown district of Tlaquepaque, southeast of Guadalajara proper. This area is characterized by a lively collection of shops centered on the pedestrian-only streets, Calle Independencia and Avenida Juárez. Emphasized in these charming shops are arts and handicrafts of all kinds: one-of-a-kind handmade furniture, textiles, jewelry, paintings, sculptures, glassware, home decor, and even chocolate. Guadalajara Cultural Tianguis (Tianguis Cultural de Guadalajara), Plaza Benito Juárez, corner Av. Wáshington and Av. 16 de Septiembre, Zona Centro. Sa 07:00-19:00. Popular especially with young people, the Tianguis Cultural is not only a great place to buy clothes and music, but also to catch free open-air concerts, mingle, see and be seen. Liberty Market (Mercado Libertad), Javier Mina 52, San Juan de Dios, ☎ +52 33 3618 0506. Daily 06:00-20:00. Known by locals as Mercado San Juan de Dios because of the river that used to pass through the area, the Mercado Libertad is a very busy, multi-story enclosed market; with hundreds of vendors, it's the largest market in Latin America. The market also houses a very popular and very good food court featuring everything from seafood to local favorites like birria (goat stew) and pozole (hominy and pork stew). It's a great place to get souvenirs. Unfortunately, it isn't the safest place in town, so make sure to always keep on the lookout for purse-snatchers. Tianguis el Baratillo, Corner of Calle Puerto Melaque and Calle Porfirio Díaz, Santa María. Su 07:30-15:00. The largest tianguis in Guadalajara, this market sells anything and everything—tools, furniture, food, clothes and accessories, kitchenware, toys, and all manner of other articles—with an emphasis on used items sold at great bargains (hence its name El Baratillo, which roughly translates as "The Flea Market"). Centro Magno, Vallarta 2425, Arcos Vallarta, ☎ +52 33 3630 1113. Located between Avenidas Vallarta and López Cotilla, the Centro Magno has a big, wide, closed space in the middle, surrounded mostly by restaurants, fashion, electronics and bazaar stores, with a cinema on the top floor. It's served directly by bus routes 629A and 629B, and routes 626, 622, 24, 258 and 101 are also nearby. Galería del Calzado, Avenida México 3225, Vallarta San Jorge, ☎ +52 33 3647 6422. M-Sa 11:00-21:00, Su 11:00-20:30. This is an entire mall that contains over 60 shoe stores, great for the dedicated footwear obsessive. As you can imagine, all prices and styles can be found here. Galerías Guadalajara, Rafael Sanzio 150, Residencial La Estancia, Zapopan, ☎ +52 33 3110 1142. Guadalajara's biggest mall is at the intersection of Avenidas Vallarta and Rafael Sanzio. It houses Guadalajara's biggest multiplex cinema, with 20 THX projection rooms and 4 VIP rooms. Has multi-level parking ramps as well as more than 1 km² of open parking space shared with a Wal-Mart and a Sam's Club. Served by bus routes 25, 47 and 629. Plaza Andares, Puerta de Hierro 4965, Fraccionamiento Plaza Andares, Zapopan, ☎ +52 33 3648 2298. At the corner of Avenidas Patria and Puerta de Hierro. Designer stores abound here: DKNY, Cartier, Hugo Boss, Mont Blanc, Helmut Lang, Fendi, Alexander McQueen, Versace, Armani, Louis Vuitton, Hermes, Valentino, Diesel, Cavalli, Calvin Klein, Channel and Dior. Plaza del Sol, López Mateos Sur 2375, Ciudad del Sol, Zapopan, ☎ +52 33 3121 5950. This mall, Guadalajara's second-largest, is near the corner of Avenidas López Mateos and Mariano Otero. The mall boasts a multi-story car park and an open layout, with big, open spaces in the middle, surrounded by hallways. Served by bus routes 357, 101, 24, 258, 626, 629, 645 and 701, as well as the longer-distance buses that connect the nearby town of Santa Anita with the metropolitan area. The Torrena Tower, measuring 336.5 m in height, is under construction next to both Plaza del Sol and Plaza Torrena, a smaller, underground mall nearby that can be recognized by its white concrete dome. Food vendors in Guadalajara seem to like to rip off foreign tourists. For example, when trying to get some tacos or a burger or something from a street food vendor, the vendor will tell you not to worry about the price, and when it's time to pay you will get an inflated bill. Be sure to ask for the price before you order. If the vendor tells you not to worry about the price, say "necesito saber" (I need to know). Of course, do this with a smile and you will not be ripped off. In addition to traditional Mexican specialties, Tapatíos seem to be especially fond of Italian food—a considerable number of restaurants of that type can be found around Guadalajara. If you miss American fast food, worry not: in addition to the restaurants listed here, Guadalajara has 14 McDonald's outlets. Birrería Las Nueve Esquinas, Cristóbal Colón 384, Zona Centro, ☎ +52 33 3613 6260. M-Sa 09:00-22:00, Su 09:00-19:30. Well known for its lamb birria, a specialty of Jalisco, this popular place is in an old part of the Centro Histórico called "Las Nueve Esquinas" (Nine Corners), for its unusual street layout. La Chata, Corona 126, Zona Centro, ☎ +52 33 3613 1315. Daily 07:30-00:00. Very popular and very crowded. Traditional food the way mom used to make it, or so they say. Needless to say the prices are higher here than in other places serving the same fare—but still pretty reasonable. M$60-190. La Fonda de San Miguel, Donato Guerra 25, Zona Centro, ☎ +52 33 3613 0793. M 08:30-18:00, Tu-Sa 08:30-12:00, Su 08:30-21:00. The restaurant is housed in an old convent, with most of the seating in the covered courtyard. It is quite picturesque. The fare is traditional Mexican, including standards like chicken in mole poblano, and chiles en nogada. Open for lunch and dinner Su-M; lunch only Tu-Sa. M$120-200. La Rinconada, Morelos 86, Zona Centro, ☎ +52 33 3613 9925. It's on the Calle de Morelos pedestrian mall in the Centro Histórico, in a restored 19th-century mansion. Traditional Mexican fare (including breakfast) is served to the tourist crowd, with serenades by strolling mariachis in the evening. M$70-300. Almacén del Bife, Plaza Andares 4965, Puerta de Hierro, Zapopan, ☎ +52 33 3611 2668. Daily 13:00-00:00. "Beer and wine, our passion" (in translation) is the motto of this Argentinian restaurant in Plaza Andares. In addition, a wide selection of chicken dishes, pastas and a daily seafood special are offered. M$120-800. Chop, México 2328, Ladrón de Guevara, ☎ +52 33 3630 3557. Su-Th8:00-00:00, F Sa 08:00-01:00. Lovely deli midway between Chapultepec and Minerva and owned by a local chain of coffeehouses. Salads, sandwiches and wraps, paninis, calzone and pizza are on the menu, as well as a large selection of breakfasts served daily. Kids' menu. M$60-135. Goa... Un Sabor de la India, López Cotilla 1520, Americana, ☎ +52 33 3615 6173. M 16:00-22:00, Tu-Sa 13:00-00:00, Su 13:00-19:00. A restaurant specializing in North Indian cuisine served in a lovely and exotic environment. M$100-200. El Sacromonte, Pedro Moreno 1398, Americana, ☎ +52 33 3825 5447. M-Sa 13:30-00:00, Su 13:30-18:00. The food here is traditional Mexican served a little more artfully for a more well-off clientele. Subdued, violin-centered mariachis play here in the early afternoon. Il Duomo, de las Américas 302, Ladrón de Guevara, ☎ +52 33 3615 4952. Daily 13:30-00:00. Creative Italian cuisine at reasonable prices including pastas, meat dishes and fine wines, served by polite and attentive (but not over-attentive) waitstaff. Kamilos 333, José Clemente Orozco 333, Santa Teresita, ☎ +52 33 3825 7869. Daily 08:00-01:00. Unpretentious, traditional Mexican fare reigns supreme here—Kamilos' menu goes heavy on meat dishes, which are juicy and delicious. Breakfast served daily. Those who don't speak Spanish well may have trouble with the (intentionally) misspelled words on the menu—"camarones" becomes "kamaronez", "quesadilla" is rendered "kezadya", etc. Suehiro, La Paz 1701, Americana, ☎ +52 33 3826 0094. M-Sa 13:30-17:30 and 19:30-23:30, Su 13:00-19:00. Laid-back Japanese restaurant whose gargantuan menu encompasses excellently prepared cuisine in the teppanyaki, nabemono, and tempura cooking styles, as well as a huge selection of sushi and sashimi. Quality and service are beyond compare. Outside is a beautifully landscaped garden complete with koi pond. Tacos Providencia, Rubén Darío 534, Lomas de Guevara, ☎ +52 33 3641 6049. The tacos this place serves up—particularly the tacos al pastor, the specialty here—have been described as the best in Guadalajara. Quesadillas are also served. Tintoretto, México 2916, Residencial Juan Manuel, ☎ +52 33 3642 7242. Daily 13:00-01:00. Elegant and mouth-watering—and surprisingly reasonably priced—Italo-Argentinian fare featuring a mind-boggling selection of steaks and chops, carpaccios, wood-fired pizzas, salads, pasta dishes, desserts, and fine wines. [dead link] Casa Fuerte, Independencia 224, Tlaquepaque Centro, Tlaquepaque, ☎ +52 33 3639 6481. Daily 12:00-20:00. An artful and upscale, yet faithful, take on traditional Mexican cuisine served up in an elegant old mansion in historic downtown Tlaquepaque. TlaquePasta, Reforma 139, Tlaquepaque Centro, Tlaquepaque, ☎ +52 33 3635 7522. M-Th 17:00-22:00, F-Su 14:00-22:00. It's in the Quinta Don José Boutique Hotel, and offers a nice mix of cuisines, with traditional Tapatío dishes rubbing shoulders on the menu with the only Italian specialties available in Tlaquepaque. Great tasting food, attractive setting, and reasonable prices. Guadalajara has a vibrant nightlife that's spread out all over the city, from the touristy places in the Centro Histórico (Plaza de la Liberación is a good place to start your search) to the college bars in Zapopan. However, perhaps the most active bar district in Guadalajara is centered along Avenida Chapultepec between Hidalgo and Niños Héroes, about 2km west of the Centro Histórico. This is the place where GDL's hipster crowd makes the scene, with bar after bar lining the sides of the streets. Many of these places double as popular live music venues. Impala Bar, Enrique Díaz de León Sur 132, Americana, ☎ +52 33 3827 3266. W-Sa 21:00-03:00. Directly in front of the Expiatorio, this place is very popular with the college hipster crowd and occasionally hosts live music acts. Angel's Club, López Cotilla 1449, Americana, ☎ +52 33 3630 5478. At the center of the gay nightlife district, the Zona Rosa, the biggest LGBT bar in Guadalajara also attracts a healthy-size straight female crowd with its thumping music and smart decor. Anime Bar, Chapultepec Sur 193, Americana, ☎ +52 33 3827 5990. Well-known to the locals known for its lit up bottles on the shelves, the Anime Bar has low-key lighting and plays contemporary music. Bar Américas, de las Américas 959, Ladrón de Guevara, ☎ +52 33 3585 8463. W-Su 21:00-05:00. Popular with fans of electronic music, this lively bar and concert venue features DJs spinning house, trance, and techno tunes and ladies' night every Thursday, Saturday and Sunday. Barba Negra, Justo Sierra 2194, Ladrón de Guevara, ☎ +52 33 3673 3802. W Th 13:00-02:00, F 13:00-03:00, Sa 19:30-03:00. Features live rock music. La Incondicional, México 2916, Ladrón de Guevara, ☎ +52 33 3640 1592. M Tu 19:00-03:00, W-Sa 19:00-04:00. Every drink you can imagine, and DJs every night. Salón del Bosque, José Guadalupe Zuno 2200, Americana, ☎ +52 33 3616 4297. M Tu Sa 13:00-23:00, W-F 13:00-01:00. Upscale, laid-back atmosphere featuring live jazz and bossa nova. La Diablita Cantina, Lázaro Cárdenas 3475, Chapalita, Zapopan, ☎ +52 33 3121 9110. Tu-Su 13:00-04:00. Beer and snacks with a side order of live alternative rock (no cover). La Jijurria, 20 de Noviembre 351, Zapopan Centro, Zapopan, ☎ +52 33 3365 0051. Su Tu W 18:00-01:00, Th-Sa 18:00-03:00. This laid-back place in downtown Zapopan features food, drink and occasional live music. El Palco Sports Bar, 20 de Noviembre 351 Int. 28 y 35, Zapopan Centro, Zapopan, ☎ +52 33 1140 9481. Sports bar in the heart of historic downtown Zapopan featuring beer, snacks, and many large-screen TVs showing sports. There are many inexpensive hotels available in the city center, especially around the old bus station (Central Camionera Vieja). If you plan to spend much time downtown, don't get a hotel farther away—it's much more convenient to be within walking distance of your daytime activities than to navigate the bus system back to a less central location (e.g. the Minerva area), and walking long distances through the streets of Guadalajara late at night is not a terribly good idea. [dead link] Hostal de María, Nueva Galicia 924, Zona Centro, ☎ +52 33 3614 6230. A great place with a bohemian vibe in the historic neighborhood of Nueve Esquinas. Hostel has dormitories with shared baths as well as private rooms with private baths, and a common dining area perfect for lounging. Dorm beds M$170/night ($160 with HI membership), private rooms M$390-410/night. Hostel Hospedarte Guadalajara Centro, Maestranza 147, Zona Centro, ☎ +52 33 3562 7520. This youth hostel is situated in a stately National Heritage building from the 19th century. Reading room, common area with TV, free wireless Internet. Organized tours to Tequila leave regularly from the hostel, including two distilleries. Dorm beds M$180/night ($160 with HI membership), private rooms M$350-720/night. Hostel Tequila Backpacker, Hidalgo 1160, Zona Centro, ☎ +52 33 3825 1326. Check-in: anytime, check-out: 12:00. Free breakfast, hot showers, very clean, excellent reviews. Restaurant on ground floor that serves traditional Mexican food. Promotions are available (buy 3 nights get a 4th free, student discounts, etc.) M$180-450/night. Hotel de Mendoza, Venustiano Carranza 16, Zona Centro, ☎ +52 33 3942 5151. Check-in: 15:00, check-out: 13:00. At the Hotel de Mendoza, guests can stay in a peaceful, airy ambience within walking distance of all Centro Histórico destinations. Rooms (including suites) include free WiFi, 32-inch flat screen TVs, and charming colonial decor; the hotel also has a business center, gym, restaurant and outdoor pool. M$840-1050/night. Hotel San Francisco Plaza, Degollado 267, Zona Centro, ☎ +52 33 3613 3256. Check-in: noon, check-out: 14:00. In operation since 1986, this colonial-style hotel is a few blocks from the storied Teatro Degollado and is centered on two covered courtyards. There are some awful rooms, so it's worth talking to the person you reserve with to see what it will cost to get a room on one of the courtyards, on an upper floor, and away from the north side of the building where there is quite a bit of traffic. Merced is a good guy to talk with about this or anything else. Although he denies being "el jefe", he seems to be in charge. Air conditioning, full baths, free WiFi. Suites available. Personal laundry available for a small fee. Breakfasts at the hotel restaurant ("Don Quijote") are very good. Beatriz, the usual morning waitress, is a bundle of sunshine. M$690/nt. [dead link] Hostal Galería, Morelos 1281, Americana, ☎ +52 33 3825 3801. Check-in: 14:00, check-out: 12:00. It's a short walk from the bars, nightclubs and restaurants of Chapultepec, 15 minutes by foot from the Centro Histórico. The hostel has twin size beds in all the rooms, WiFi, hot showers, roof terrace, roof garden, free breakfast, and helpful staff. For an extra fee, walking tours of Guadalajara are offered as well as longer bus excursions to regional destinations such as Chapala and Tequila. M$180-490/nt. Fiesta Americana Guadalajara, Aurelio Aceves 225, Vallarte Poniente, ☎ +52 33 3818 1400. Check-in: 15:00, check-out: 13:00. The Fiesta Americana is in a quiet yet hip residential area in the shadow of the Glorieta de la Minerva monument. Its lively nightclub attracts its share of hip young locals. It's a business hotel, minutes from the World Trade Center Guadalajara and has the city's second-largest convention center. Each room has a coffeemaker, minibar, and cable television, with deluxe rooms also have individual sofas with footrests and phones. Business center and room service operate 24 hours a day. The hotel offers a fitness center, laundry, dry cleaning and ironing service, gift shop, currency exchange, concierge, restaurant, airport shuttle.. There's free high-speed wireless Internet all over the property. Parking costs M$50/day, but it comes with complimentary valet service. M$850-1800/nt. Hotel NH Guadalajara, Sao Paulo 2334, Providencia, ☎ +52 33 3648 9500. Check-in: 15:00, check-out: 12:00. A luxury business hotel next to Country Club Guadalajara in the heart of one of the city's financial districts, this high-rise hotel has 137 guest rooms with contemporary decor, amenities, and, in many cases, views over the city. Free WiFi, fitness center, restaurant ("Nhube") and garden bar, conference center, concierge services and complimentary shoeshine. Suites available. M$1500-5700/night. IbeuroHotel, Mariano Otero 3235, Fraccionamiento Valle Verde, ☎ +52 33 3134 3230. Check-in: 13:00, check-out: 12:30. Decent prices here, but you get what you pay for. For a large business hotel—one directly next to the Expo Guadalajara convention center, no less—this place skimps on the amenities. Still, the rooms are clean and all the basics are covered: color television, air conditioning, telephone, free wireless Internet, laundry and dry cleaning. Adequate if unimpressive food is served in the cafeteria. Private covered parking lot. M$660-1200/night. La Mansión del Sol, Moctezuma 1596, Ciudad del Sol, Zapopan, ☎ +52 33 3647 4762. Check-in: 15:00, check-out: 12:00. "Modern yet unmistakably Mexican" is a good way to describe the decor of this luxury boutique hotel in Zapopan. Manicured exterior with sitting areas, a fountain, palm trees and ubiquitous hummingbirds surround this lovely property whose airy rooms boast all the modern amenities: 32" LCD flat-screen TV's, CD stereo system, alarm clock, hair dryer, workspace, free wireless Internet, ironing board, and dessert minibars. Other amenities include an on-site bar and restaurant ("Los Colibríes"), laundry and dry-cleaning service, sauna and steam room, business center, gym, complimentary continental breakfast, and room service. M$1500/night. Posada del Marqués, Victoriano Salado Álvarez 72, Ladrón de Guevara, ☎ +52 33 3630 3206. Check-in: 15:00, check-out: 12:00. An all-suite property near the charming Minerva district. The living areas, kitchenettes, and work areas all have modern decor and amenities such as air conditioning and free WiFi. Some suites also have full kitchens. There's also a fitness center, an outdoor pool, and complimentary breakfast. M$1080-1600/night. Villa Ganz, López Cotilla 1739, Lafayette, ☎ +52 33 3120 1416. In the heart of the Zona Rosa. A 1930s mansion-turned-boutique hotel. Villa Ganz's ten suites are named after Jalisciense author Juan Rolfo's literary creations. Amenities include air conditioning, cable TV, hair dryers, and free WiFi, antique furnishings and decor, custom-designed toiletries, designer bathrobes and slippers, bedding and duvets containing imported goose, bookcases containing a wide-ranging selection of literature, and elegant French doors looking out either onto the peaceful garden or lively Avenida López Cotilla. A concierge is on staff. Guests at Villa Ganz also receive complimentary access to the Kristal Century gym, one block away from the hotel—this includes yoga, Pilates, and dance classes. Complimentary breakfast is served, as well as wine and appetizers in the evening. M$1900-2800/night. [dead link] Casa Venezuela, Venezuela 459, Americana, ☎ +52 33 3826 6590. Check-in: 14:00, check-out: 12:00. This charming B&B a few blocks off hip Avenida Chapultepec has three rooms decorated in Old Mexico style. Guest rooms have hair dryers, and TVs with DVD player. The breakfast offers American and Mexican specialties served on locally-produced crockery. Complimentary cocktails are served on the terrace each evening. The American-born owner, George, has an encyclopedic knowledge about everything Guadalajara and the surrounding vicinity have to offer. M$1400-1800/night, additional guest $185/night. Hotel La Calandria, Estadio 100, Las Conchas, ☎ +52 33 3619 6579. What this hotel lacks in luxury, it more than makes up for in old-Mexico charm. A very clean and generally very nice property for very reasonable prices. Bilingual staff, WiFi available in public areas. It's a short distance south of the Centro Histórico, near Parque Agua Azul and the old bus station, where buses leave regularly for popular regional destinations such as Cocula and Tequila. On-street parking, but there are many free parking lots available (including Walmart, which is also nearby). M$135-250/night. Quinta Don José, Reforma 139, Tlaquepaque Centro, Tlaquepaque, ☎ +52 33 3635 7522. Check-in: 14:00, check-out: 12:00. Charming 19-room boutique hotel in the heart of Old Tlaquepaque. Amenities include high-speed WiFi, cable TV, air conditioning, complimentary continental breakfast (a full breakfast featuring traditional Mexican favorites is also available for an extra fee), an onsite tequila bar and restaurant (TlaquePasta). Landscaped exterior, tiled pool, manicured gardens, and a leafy terrace. Airy, sun-drenched rooms decorated with Old Mexican traditionalism and contemporary simplicity. The hotel organizes group tours of the artisan workshops that have made Tlaquepaque famous, and excursions to the Laguna de Chapala, Guachimontones, Tequila, and downtown Guadalajara (20 minutes away by car). M$980-1900/night. Guadalajara is known as one of the safest cities in Mexico. Nonetheless, as in any large city, the usual precautions should be taken. Crimes against tourists and foreign students are quite infrequent and mostly take the form of purse-snatching. Criminals usually work in teams and target travelers in outdoor restaurants, bars and other busy places. Should anyone spill something on you, be alert to your surroundings and step away—accidental spills are a common method of distracting their marks. Situated in a picturesque countryside setting, Tequila is perhaps the quintessential Guadalajara side trip and, needless to say, is the best place to sample Mexico's favorite liquor. The Jose Cuervo distillery has a packaged tour that will pick you up from your hotel, take you to an agave farm, then to the distillery for a tour with free samples and a gift shop, then gift you with vouchers for a free margarita and 10% off at a local restaurant. The city itself is also quaint and worth exploring. Tequila is easily accessible by bus (about 90 minutes one-way; about M$120-150), and many hotels organize excursions there for their guests. However, perhaps the most charming way of getting to Tequila is the Tequila Express, a charming tourist railroad complete with tequila shots and roving mariachis. The train leaves Guadalajara's train station Sa & Su 10:00, returning the same evening. The Laguna de Chapala is the main regional vacation spot, a lovely lake surrounded by picturesque towns such as Chapala and Ajijic (the latter of which has a sizeable gringo expat community). Mazamitla is a picturesque town in Los Altos south of Laguna de Chapala. Tapalpa is a great mountain town near Ciudad Guzmán that serves as a weekend retreat for Tapatíos. 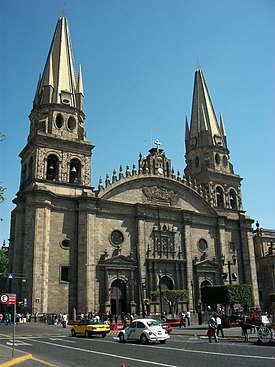 San Juan de los Lagos is the second-most visited pilgrimage site in Mexico (after the Basílica de Guadalupe in Mexico City). This city travel guide to Guadalajara has guide status. It has a variety of good, quality information including hotels, restaurants, attractions and travel details. Please contribute and help us make it a star!